“Sarasota Jazz Project” is a high energy 17 piece jazz ensemble comprised of some of the finest musicians on the West Coast of Florida. These talented all-stars play both original compositions and standard tunes, creatively arranged in a unique contemporary Big Band style. Whether you dance, or listen or both, be prepared to be thoroughly entertained. The Sarasota Jazz Project Big Band performs at jazz concerts, clubs, schools/universities, private clubs, and Jazz Club of Sarasota events throughout the year. The Sarasota Jazz Project is a seventeen piece Big Band dedicated to the preservation, promotion, and public performance of big band jazz music in Sarasota and the neighboring communities in the state of Florida. Founded in February 2010 by George McLean and George McLain (no relation! ), the band is comprised of the best available local musicians, including professional jazz musicians with long resumes and careers in performing with top-name bands and jazz musicicans throughout the world. Members also include local music teachers and educators; working musicians who perform regularly in local theaters,orchestras and cabaret venues; and other serious local musicianswho maintain "day jobs"and play jazz for the sheer pleasure and exhilaration ofbeing a part of this true American art form. 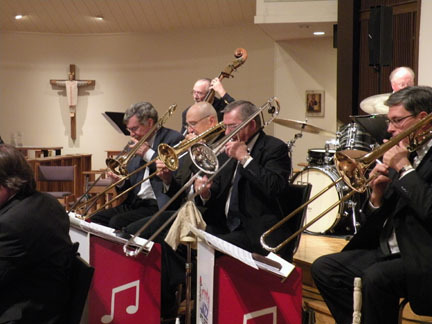 While respecting and performing music of great big bands of the past led by such luminaries as Duke Ellington, Count Basie, Benny Goodman and Glen Miller, the Sarasota Jazz Project emphasizes the work of modern composers and arrangers such as Miles Davis, Wayne Shorter, Quincy Jones, and Gil Evans. Perhaps the mostdistinctive element of the Sarasota Jazz Project repetoire is its great collection of popular music and standards arranged in new and exciting jazz settings by thevery best current musical arrangers in the world, including George Stone, Brad Morey, Gary Urwin, Ed Vizinho, Don Schamber and John Clayton. The specific goal of the Sarasota Jazz Project is to expose the jazz-loving public to these new sounds and musical settings, including original compositions and arrangements written by our own members. While the Band will perform some of the great treasure of existing literature at the highest level of artistry and taste, including respresetative vocal renditions of classics by Frank Sinatra, Tony Bennett, Nat King Cole, and Mel Torme, the emphasis of Sarasota Jazz Project is the preservation and expansion of America's only true native musical art form through innovation in the performance of existing standard works and dedication to locating and presenting the best new works to the public. Sarasota Jazz Project provides music that is both listenable and danceable, both familiar and challenging. But always expect to hear the spontaneous creativity that is the essence of Jazz! We frequently collaborate with the Jazz Club of Sarasota for concerts and events. We do private and public parties, so give us a call to jazz up your event today! The band's co-founder, director, frontman, booking agent, tenor player, and occasional singer. Jazz trumpet player in the band and this website's creator/developer. The band's lead trumpet player. Jazz and lead trumpet player. Trumpet player and occasional frontman for Sarasota Jazz Project. The band's lead tenor saxophone and major contributor of compositions and arrangements. The band's lead alto saxophone. Baritone sax for the band.